I am a firm believer that you should teach children the art of crafting at a young age and continue to nurture them as they grow. For me, there is nothing more exciting than throwing a bunch of craft supplies onto a table and watching to see what a child decides to do with them. But what is really fun to do with children is to scrapbook with them, especially if they use pictures they took by themselves. Kids love that! And instead of worrying about your kids dropping your good camera buy them their own disposable one. One of the great things about scrapbooking is it is a project that can be worked on and put aside throughout the year. Children from the age of eight and up can create an album on their own. But children under the age of eight will need a little more help. What do you need to get started? Well, first of all keep in mind that the album you are going to be working on is something for your child, not you. Don’t worry if everything is not perfect or totally acid-free. It’s their project, so let them lead the way. When you’re ready to shop for materials, take them with you to the store and let them pick out all the things they want to include in their album. Your child can make an album without breaking your bank account. You can purchase materials at your local discount store. 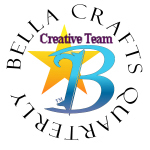 The items you will need to get started should be some card stock, colored pencils or some of those glitter gel pens kids love to draw with, a few stickers and embellishments and a glue stick. Of course if you are a rubber stamper like me, you’ll also want your children to have a stamp (or two!) And a dye based ink pad probably in black, so they can color the image. Once you have your materials together, you’re ready to start the fun! 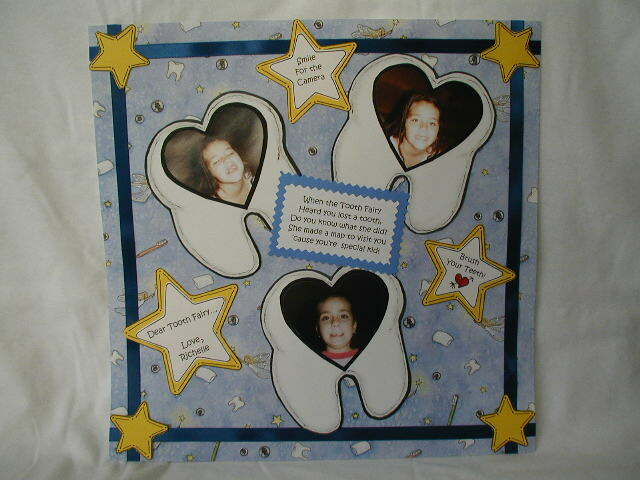 The scrapbook page I have included was created by my daughter Richelle, when she was a little girl. 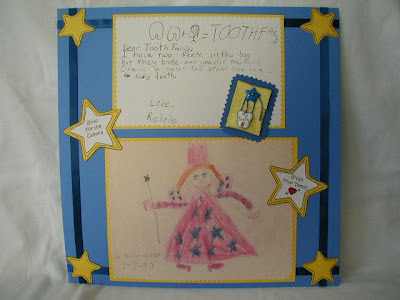 She had found the picture and letter she had made for the tooth fairy that I had saved for her and decided she wanted to create a page using the items. 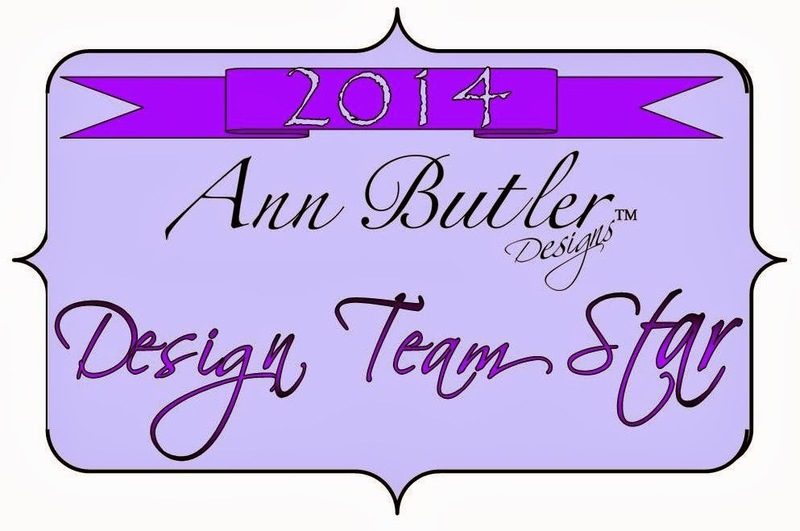 Here’s how she did it-She used decorative scissors around both items and layered them onto yellow card stock. She cut out yellow stars and drew lines and dots around the edges. Next, she glued blue ribbon, the stars and her pictures onto a 12″ x 12″ piece of blue card stock. I printed out the text for her on my computer. She made stars from white card stock and glued them onto the yellow stars. I had made her a small pouch from ribbon. She drew a small tooth, cut it out and attached some string to it. She sewed a button on the pouch and attached the small tooth. Then she adhered the pouch to a piece of dark blue card stock, used decorative scissors around the edges and adhered it to her page. The second page was made with pattern paper. She adhered the ribbon and stars like the first page, then we drew a picture of a tooth on white card stock which sh cut out and added her pictures to. My little girl is now a beautiful grown woman who is now pregnant with her first child. We had so much fun creating this page together and my hope for her and her child is that they take the time to create a scrapbook page or two together. Of course with Nana being around, I see lots of different crafting going on in this child's life. I hope that you find that same joy scrapbooking with your children. It really is a blast! What Tools Do I Really Need Just Starting Out? Home Decor Project with CraZy TACKz? Keeping Track of Your Stamps!